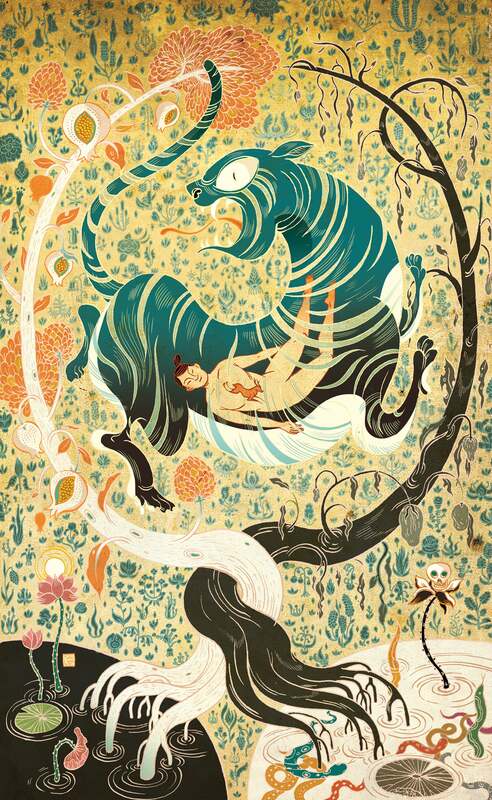 Illustrator Victo Ngai has beautifully visualised eight of the stories in this fascinating collection that reflects the defining philosophies of Chinese culture. This landmark collection, spanning two millennia of storytelling, illuminates the beliefs and traditions that have shaped Chinese society. Each magical tale, whether depicting a wise judge, a poor family struggling to outwit a corrupt bureaucrat, or an insect coming to the aid of a human, reflects one of the three core Chinese philosophies: Confucianism, Taoism and Buddhism. Interweaving the lives of mortals with the animal kingdom and the realm of gods and ghosts, these tales range from fables to stories of enchantment and magic. Aimed at adult readers, they are often the work of great philosophers; many are by the venerable P’u Sung-ling, who opposed the rigid orthodoxies of Confucianism; over 20 are by the Taoists Chuang Tzu and Lieh Tzu. Taoists believe that all things are created equal, rejecting the hierarchical worldview of the Confucians. Among Lieh’s tales are ‘Black and White’ and ‘Man or Beast’, which promote respect for animals. ‘The Golden Toothpick’ – the brief, sad tale of a hapless serving maid – warns against aligning lowly social status with lack of virtue. The Buddhist stories similarly espouse compassion towards all living things, perceiving human and animal forms as fluid and interchangeable. In ‘Three Former Lives’, the errant scholar Liu is reincarnated as a horse and then as a dog before finally, having atoned for his misdemeanours, being reborn as a man. The Confucians, conversely, view social order in terms of inherited status. The imperial family occupied the highest stratum; women, children and animals the lowest. Tales such as ‘A Clever Judge’ reinforce this doctrine, illustrating that stability and justice is achieved when social obligations are properly assigned and fulfilled. In her preface, award-winning author Yiyun Li recalls her grandfather’s love of these tales, and how they continue to resonate with her own life. Victo Ngai, a New York based illustrator from Hong Kong, has beautifully visualised eight of the stories and created an exquisite binding design. This collection of stories serves two purposes: it gives readers some sense of how imaginative fiction reflects each of the three teachings of Chinese civilization (Confucian, Daoist and Buddhist); and it shows how fairy tales or, as the Chinese call them, supernatural tales (shenhua), give voice to the injustices inflicted on subordinated and exploited groups, namely, children, women, animals and foreigners. The boundary between the human and the animal is the boundary between the social (or civilised) and the biological (or barbaric), an issue of the utmost importance in Chinese culture. Sublimation of the latter into the former is a major goal of the benevolent authoritarianism of Confucianism, which affirms the superiority of man over animal. Such themes are prevalent in tales like ‘North Country Wolf’, and ‘The Repentant Tiger’ and ‘Tiger Boys’; the tiger tales show the power of filial piety, the cardinal virtue of Chinese society. A contrary Daoist view – the dominant one in this collection – is found in the short tales ‘Man and Beast’ and ‘Man or Beast’ in the Animal Kingdom section. Both tales question the dominance of the human over the animal, and invest the latter with virtues that those in authority have failed to act upon. Unlike Aesop’s method of using animals to illustrate human failings, the Chinese tales illustrate human virtues in animal guise – an inversion of values. Agency and authority is given to animals, to children and to women. In this Daoist angle of vision man holds a tiny place in the whole range of creation and must not exceed that place or aggrandise his position. Lastly the collection contains a few Buddhist selections, showing how the idea of reincarnation overcomes the boundaries between human and animal, and even life and death. Tales such as ‘Suited to Be a Fish’ and ‘The Wizard’s Lesson’ are not directly involved in the Confucian–Daoist opposition, having rather more to do with the idea of transmigration, a crossing of an open border between the living and the afterlife. Here the human and animal worlds are part of a larger cosmic process. That is why the Buddhist concept of time is so vast, measured in eons, and thus capable of containing endless transformations and transcending human categories and judgment, unlike seasonal (Daoist) time or generational (Confucian or social) time, both of which confine themselves to moral evaluations. With a preface by the Nobel Prize-winning author Wole Soyinka, this anthology collects folktales from across the African continent – including classic trickster tales like ‘Spider Outwits the Rich Woman’, and stories about navigating the complexities of life, such as ‘Never Ask Me About My Family’.